A child kisses a tombstone at the tomb of his uncle, who died when North Korea sank the Navy corvette Cheonan, at the National Cemetery in Daejeon on Saturday. President Park Geun-hye is to preside on Tuesday over a ceremony at the National Cemetery in Daejeon marking the sinking of the Navy corvette Cheonan in 2010. It will be attended by the families of 46 South Korean sailors who died in the attack, as well as the widow of Navy Warrant Officer Han Joo-ho, who drowned during the search for survivors. Park hopes to send a strong warning to North Korea against further provocations. Meanwhile, the military is coming up with detailed plans to respond to any North Korean provocations, possibly by launching surgical missile strikes on statues of the North’s nation founder Kim Il-sung and his son Kim Jong-il. 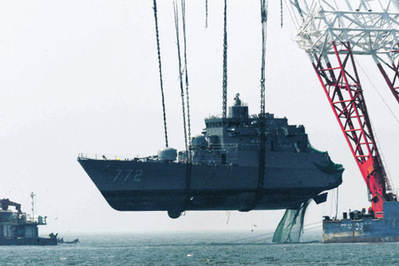 The military apparently began to consider the plan seriously after the Cheonan sank in March 2010 and reached a final decision following the North's shelling of Yeonpyeong Island later that year. There are some 35,000 statues and other monuments in the North deifying the two Kims, including two huge bronze statues atop Mansudae Hill in Pyongyang. The military has come up with a priority target list with detailed information on their location, size and other characteristics based on satellite photos and other information. Since the sinking, the Navy has boosted the number of random training missions involving fighter jets and anti-submarine operations. Eight new P-3CK maritime patrol aircraft have been deployed into service. But it is unclear whether the Navy has done all it can to bolster naval warfare capabilities and prevent another North Korean submarine attack like the one that sank the corvette. North Korea has apparently also increased the number of infiltration training missions involving submarines and semi-submersible vessels. Since earlier this month, North Korean semi-submersible vessels have been conducting drills near the Northern Limit Line, the de facto maritime border between the two Koreas. The semi-submersibles are capable of being mounted with CHT-02D torpedoes like the one that sank the Cheonan. The Navy had planned to upgrade the submarine-detection capabilities of 30 naval vessels, including corvettes (1,200 tons) like the Cheonan and frigates (1,800 tons), by equipping them with enhanced sonar equipment. The old sonar equipment is capable of detecting targets only 2 km away, while the new system can sniff out submarines up to 10 to 15 km away. But most South Korean corvettes and frigates were made in the 1980s and are for the scrap heap within the next decade. It would cost a lot of money to refit them with advanced sonar, so the government has scrapped the plans. The Navy has almost finished installing underwater listening posts called SOSUS near the NLL, but it will take time before they can be put to full use since the Navy has not collected enough information about the audio signatures of North Korean submarines.